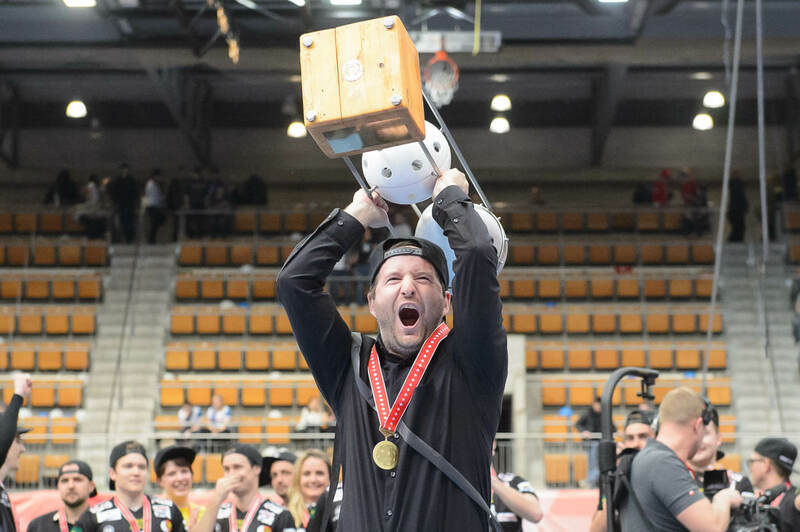 Sideline Sports Blog | Floorball: Unihockey Tigers Langnau – winner of Swiss Cup! Floorball: Unihockey Tigers Langnau – winner of Swiss Cup! XPS Network has registered big success in recent times. One of our floorball partners in Switzerland won the Swiss national cup! Team Unihockey Tigers Langnau is the winner of this prestige cup after long 9 years and infinite 14 penalty shoutouts in the final match against GC Zurich. Part of this big achievement were also two Czech legionaries. Coach and also XPS country manager for Switzerland, Michal Rybka and former player of Unihockey Tigers Langnau, Martin Kisugite. Michal was awake for hours and hours in a row and did detailed video analyzation in XPS to fully prepare his team on this match of the year. Martin Kisugite needed to mentally prepare himself so well to be able to score the last decisive penalty shot. We asked Michal Rybka on a few questions about this success and how was XPS part of it. Can you describe your feelings immediately after the last 14th penalty shot scored by Martin Kisugite and Tigers became champions of the Swiss national cup? Big happiness. I was trying to be calm, don’t let anything disturb me, focus on team and players performance and watch opponents tactic moves and react to them. Euphory came right after Martin’s final score in the penalty shot. You faced GC Zurich twice in this season and your opponent won both times (7:0 and 6:5 OT). Did you make any special moves and tactic changes before this third and most important match against this opponent? First result (7:0) looks terible but we had our chances to score. Pascal Meier (goalkeeper of GC) done incredible job in that match and caught every single shot. In the second match GC hadn’t available the best players and we used really defensive game style. I think GC used their best players after second period and we started to feel scared of game result. Anyway we had totally different game preparation on the final match of the Swiss cup. We had first meeting at 3pm (start of the match was at 7:15pm) on team lunch and then we had walk together. After the mental preparation we had one tactic meeting with all of those video analysis from XPS video analyzer and we were ready to move to Bern on the final match. Everyone in Switzerland takes this Swiss cup really seriously and that is the reason why this preparation was so special. How did you use XPS Network software during this special game preparation? XPS Network is part of our game preparations on every match. I did detailed video analysis on every GC’s player. I used several match recordings of GC, cut all of their possibilities of free hits, powerplay, shorthanded plays. I cut also strongest and weakest sides of the main leaders of GC, Pascal Meier and Luca Graf. We knew everything about GC I would say. What does this win mean to the future of the national Swiss league? Unfortunatelly we didn’t make it into the playoff. League season didn’t look good from the very beginning, but we know where all the problems came from. All of those problems were such a small ones, but all of them together transform into the bigger one. I am totally in charge of this unsuccessful league season but we will be stronger in the next season. Otherwise, we did everything well in the Swiss national cup and our performance in every important match during cup playoff was stunning and we made it up to the final. Tigers have won this cup after long 9 years. What does this win mean to the club and its future development? Of course it is big success for club and for the men’s team as well. Last year when Johan Samuelsson and his brother Anton played for us everyone talked about the final of the Swiss cup and we didn’t make it. No one talked about the final cup this season and look…we won! The future of this club is really interesting and we are currently facing so many ways to go and we must make the right decision which one to choose and make the best possible future for Tigers. But our main goal is to win playout and secure the spot in the best Swiss league for next season. Thank you Michal for this interview and all the Sideline Sports team wish you and your team best luck in playout matches!